In an exciting one-time deal, co-founder Robby Noonan will be presenting a 500 mile (Yes, you read that right) race through YouTube once again. Robby, aided by friends David Land and Kevin Rollins, will soon post a 200 lap special presentation for the IRA fans to enjoy! The race will feature an all-star lineup of YouTube racing personalities racing CART 1998 cars at Fontana. It is set to be released on Raceday2011's YouTube channel in the coming weeks, so follow raceday2011 on Instagram and YouTube to stay up to date on the release! In an exciting turn of collaboration, the 2018 IRA Brickel's IndyCar Series will extend a race to the post-season at Long Valley Speedway, compliments of driver Devin Kelleher. Kelleher has made independent IndyCar stop motions in the past, but this will be the first IRA IndyCar stop motion not created by Joe Donohue. The 5 lap race will be held at Long Valley Speedway, where select 2018 teams and drivers will compete in the winner-takes-all event. This race is also a pre-2019 simulation for a possible event in the incoming season, which is in works of including collaborations from multiple creators. After an exciting beginning to the 2018 IRA Brickel's IndyCar Series season, there is even more exciting news coming. For the first time in IRA history, a mid-season Press Release will be posted via Joe Donohue's YouTube channel! This release will cover information regarding the racing, officiating, and operation of the series. The Press Release does not have an official release day yet, but it is expected to come shortly following the Nazareth race. The Indy Racing Association is proud to host such a dedicated fan base of motorsports enthusiasts, and with that a new idea has been reached by member Joe Donohue. Joe has been working towards an official release of a Redbubble account specialized for the fans of the IRA, which offers a wide variety of apparel and merchandise. We are excited to now offer a way to share and support some of your favorite moments in the IRA's history. The website can be reached by navigating through the Member's tab to Joe Donohue, his YouTube channel, or in the Redbubble website itself. The IRA Brickel's IndyCar Series has reached new heights, the 2016 Indianapolis 500 has officially reached 10,000 video views on YouTube! The previous most-viewed video was the 2013 Indianapolis 500, published three years prior to the newest one. The IRA is very pleased to see the popularity of the video, and is happy to welcome new fans to the series. Being the only original IRA series still in existence, it has become very important to show a good mixture of history and new tradition in the series. Joe Donohue, creator of the race and the series, is quoted: "This is a major milestone for myself personally, the series, and the entire IRA. I've never experienced a video reaching such a high number as quickly as this one. This major accomplishment is worth a lot to me, hopefully we can keep the viewership and see another 10,000 [video views] in 2017!" Two Whole Vlogs For Indy! For the 100th running of the Indianapolis 500, the IRA has compiled what is expected to be the triple crown of vlogs! Joe Donohue and Matt Faust are working on producing a video blog from each of their point-of-views throughout the weekend. Be sure to subscribe to both of them to see the world's biggest race through the perspective of two of the IRA's finest members! Around two weeks ago, we got some breaking news from Raceday2011's Instagram saying he will be partnered with Unleashed Racing for 2016. 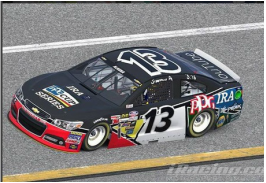 This team participates in the NASCAR iRacing.com Series, which is a top tier series in the iRacing community. Raceday2011 will be sponsoring this team for 6 races, including events at Pocono, Auto Club, Sonoma, Richmond, Dover, and Talledega. When asked about this announcement, Jimmy(driver for the team) commented, "It is such an incredible honor." Raceday2011 hinted that he was going to push to get diecasts of these schemes, which would break history in the iRacing and Diecast communities. Thanks to some great IRA supporters, @nflcupseries19 and @jjlarsonharvickfan on Instagram (give those two a follow), the IRA Indy Car World Series now has a fan page. Yes, check out @iraworldseriesfanpage on Instagram to keep up with series right on Instagram. Thank you everybody for supporting the IRA as we bring it back to new and greater heights in YouTube racing.